Lewis base – a substance that yields an electron pair of another substance, when reacting with acid. The most widely used is the Brøndsted- Lowry’s definition. Other compounds which, when dissolved in water, interact with it and release hydroxide ions: NH3, CH3NH2, etc. Turn red litmus paper blue. Weak bases only partially dissociate to give ions in solution. When a base ionizes, it leaves an OH– ion behind by taking up a hydrogen ion from the water. The solutions of weak bases have a higher H+ concentration than those of strong bases. The basicity of an aqueous solution is specified by pH. The pH of the bases is higher than 7.3. Weak are conditionally considered the bases with pH below 10. Since bases are proton acceptors, the base receives an OH– ion from water. Weak bases are less completely protonated than stronger bases and, therefore have a higher H+ concentration in the solution. Higher H+ concentration results in a lower pH. In water solution, the bases exist in chemical equilibrium. The position of the equilibrium varies depending on the strength of the base. The weaker the base, the further to the left is shifted the equilibrium. The position of the equilibrium is measured by the equilibrium constant (Kb). The more the equilibrium lies to the left, the lower the value for the constant. So the weaker bases have lower equilibrium constants. The weak bases are weak electrolytes. The ability of a solution to conduct electricity depends on the concentration of ions. The solution of a weak base has fewer ions than a solution of a strong one, and therefore it has a lower electrical conductivity. Strong bases fully dissociate to give ions in solution. They have pH between 10 and 14. Strong bases are caustic to living tissues and can cause a serious impact. Common examples of strong bases are the hydroxides of alkali and alkaline earth metals. Very strong bases can deprotonate weak acidic C-H groups even in the absence of water. The strong bases have a higher equilibrium constant, compared to the weaker ones. The strong bases are highly reactive. They are good electrolytes. The ability of a solution to conduct electricity depends on the concentration of ions. A strong base has more ions in the solution than a weak one, so it has a higher electrical conductivity. 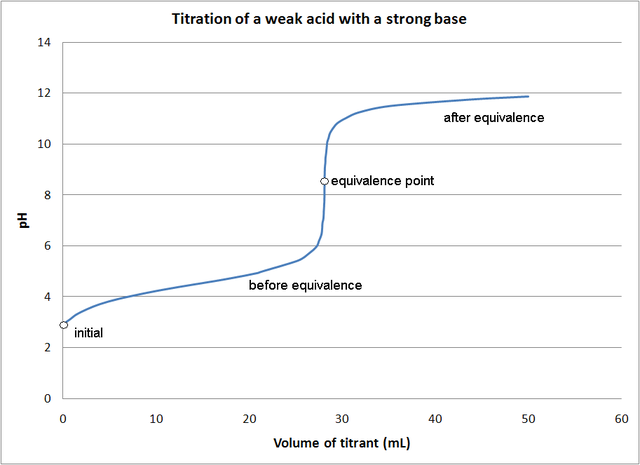 Weak Base: A weak base is one that only partially dissociates to give ions in solution. Strong Base: A strong base is one that fully dissociates to give ions in solution. Weak Base: Weak bases only partially dissociate in solution. Strong Base: Strong bases fully dissociate in solution. Weak Base: Weak bases have pH 7.3 – 10. Strong Base: Strong bases have pH 10 – 14. Weak Base: The weak bases have lower equilibrium constants, compared to the strong ones. 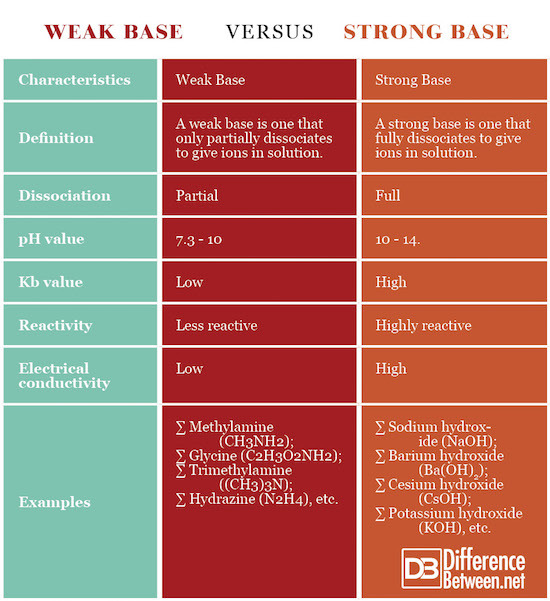 Strong Base: The strong bases have a higher equilibrium constant, compared to the weak ones. Weak Base: Weak bases are less reactive than the strong ones. Strong Base: Strong bases are highly reactive. Weak Base: The solution of a weak base has a lower electrical conductivity than this of a strong base. Strong Base: The solution of a strong base has a higher electrical conductivity than this of a weak base. Weak Base: Examples of weak bases are methylamine (CH3NH2), glycine (C2H3O2NH2), trimethylamine ((CH3)3N), hydrazine (N2H4), etc. Strong Base: Examples of strong bases are sodium hydroxide (NaOH), cesium hydroxide (CsOH), potassium hydroxide (KOH), barium hydroxide (Ba(OH)2), etc. According to the definition of Brønsted-Lowry, a base is a substance that takes up proton when reacts with acid. The bases have soapy or slimy touch and bitter taste. They react violently with reducible or acidic substances and are caustic on organic matter. A weak base is one that only partially dissociates to give ions in solution. A strong base is one that fully dissociates to give ions in solution. Weak bases only partially dissociate in a solution, while the strong bases dissociate fully in a solution. Weak bases have pH 7.3 – 10, strong ones have pH 10 – 14. The weak bases have a lower equilibrium constant, while the strong bases have a higher equilibrium constant. Strong bases are highly reactive, while weak bases are less reactive. The solution of a weak base has a lower electrical conductivity than this of a strong base. Examples of weak bases are methylamine (CH3NH2), glycine (C2H3O2NH2), trimethylamine ((CH3)3N), hydrazine (N2H4), etc. Examples of strong bases are sodium hydroxide (NaOH), barium hydroxide (Ba(OH)2), cesium hydroxide (CsOH), potassium hydroxide (KOH), etc. Dr. Mariam Bozhilova Forest Research Institute, BAS. "Difference Between Weak Base and Strong Base." DifferenceBetween.net. July 17, 2018 < http://www.differencebetween.net/science/difference-between-weak-base-and-strong-base/ >.